Collins Booksellers - A Legacy of Spies: by John le Carré??????? | Conversation Starters by dailyBooks, 9788826499468. Buy this book online. In “A Legacy of Spies”, readers are reintroduced to familiar characters and exposed to a new cast, all involved in the mystery and espionage of the Cold War. Peter Guillam, a man who has connections to British Secret Service man George Smiley, is in the midst of retirement when he is summoned to London. The Cold War has finally caught up with him and his former colleagues, drawing them back to be judged by those who are far removed from the ugly truths of the Cold War. 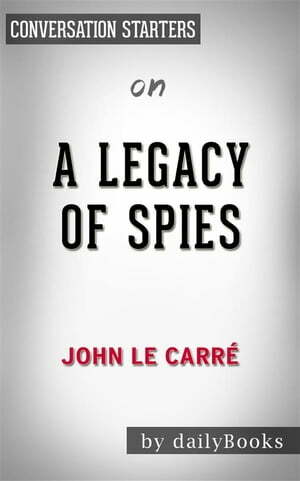 John le Carré’s latest novel, “A Legacy of Spies”, comes after over twenty-five years of silence from the author. Praised as an “undisputed master”, John le Carré continues the thrilling legacy first explored in The Spy Who Came in from the Cold and Tinker Tailor Soldier Spy.